Printing checks can help you save money, avoid running out of checks and customize the checks you use. However, those gains may be offset if you don’t follow proper bank procedure, and it might end up being more trouble than it’s worth. Get familiar with the process and typical requirements, and decide what’s best for your needs. Do it all from scratch. Order partially printed checks from a professional printer. If you don't want to do it all, the easiest solution is to have a check printer do the hard part—which is the same for every check. Outsource the tasks of putting computer-readable numbers on special paper with magnetic ink. Then you can just drop the checks into your printer to add the payee, amount, and any memos. With that approach, you don’t need to deal with special ink or download additional fonts. Check printers offer a variety of options so you can specify how your checks come out, and they use industry-standard security features. Most of their products are compatible with popular software programs, so you can focus on more important things than check formatting. While you can design and print your own checks without any special software, it takes some design skills and time. A pre-built package does most of the work for you, and the software is relatively inexpensive—especially if you can spread the cost out over a high volume of checks. There's a decent chance that you already have what you need. Popular money management software programs like Quicken and QuickBooks make it easy to create a payment and print a check. What's more, those programs help you track payments without having to enter them manually by creating a record when you print the check. Again, it's easiest to use “check stock” paper ordered from a check printer or office supply store with these programs, but you can design a template yourself if you prefer. In addition to the programs above, numerous alternative software vendors can help you create checks. Even newer accounting programs can help you print old-fashioned checks. For example, Xero allows you to customize a check design and add bank information in MICR format. You can print your own checks with almost any printer. However, it is wise to use magnetic ink if you’re going to print checks from scratch. Check reading machines at banks and retailers work best if your bank information is printed with magnetic ink. You can potentially get away with using plain-old ink (see below), but you need to know the tradeoffs. Finding magnetic ink is not always easy at local office supply stores, and it's more expensive than standard ink. Use special check stock to print checks. Check stock has security features that make it harder to alter existing checks and create fake checks using your account information. Do You Need Magnetic Ink to Print Checks? Technically, no. However, you’re taking a risk if you print bank information with standard ink. Be wary of software vendors who oversimplify the issue and claim that you can always print checks without magnetic ink. Bank information only: The entire check doesn’t need magnetic ink. The most important part is your bank information, including the routing number and your account number. Those are the funny looking numbers along the bottom of a check, also known as the MICR line. If you had these numbers preprinted by a check printer and you’re only printing payee information and the amount, you don’t need magnetic ink. Evolving deposits: Computers with magnetic readers read the account information off these checks to speed processing. 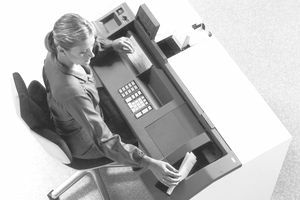 While we are certainly moving toward optical readers, some checks still go through traditional readers. In the age of mobile check deposits, where consumers snap a picture of a check to make a deposit, the need for magnetic ink is decreasing. What if you print your checks without magnetic ink, and the check passes through a magnetic reader? Then the check has to be processed manually, which can result in fees for you or your payee, as well as slower processing. The safest route is to use magnetic ink. It is more expensive than regular ink, but it’s not outrageous. If you just need a single check, your bank might be able to give you what you need. For example, you might need to provide a voided check for setting up direct deposit, or you might have a one-off situation that requires a paper check. Banks usually offer small quantities of checks with your account information printed on them for a small fee. Call ahead and ask if it's possible to get a counter check before you make a trip to the branch. Once you have the materials you need, you’re ready to make a payment. If you’re using accounting software, the program should automate most tasks for you. Otherwise, enter the date, amount, and other information as if you were writing a check by hand.